If you are a gun owner you know keeping your guns away from a thief and children is a big part owning a gun. 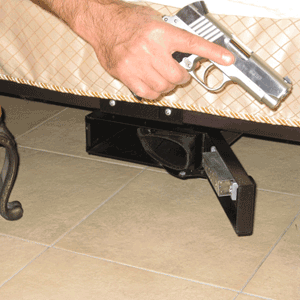 Under bed gun safes are great investments for all gun owners. The reason is, many gun safes are large and can’t be hidden. A large gun safe can be tampered with by a burglar. Gun safe companies usually have a warranty in place in the event a burglar damages your gun safe but if the warranty is outdated you will have to fix the safe out of your pocket or purchase a new safe. You also want a safe that will make getting to your weapon accessible in the event an intruder enters your home. 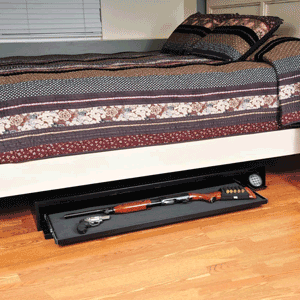 An under-bed gun safe is a great investment for all gun owners. It is made for easy access and secure storage. Having a gun locked away under your bed that you can quickly access will give you a better peace of mind. If you have a handgun for protection, it will be useless if you have it locked in a larger gun safe and is not easily accessed. Many of them come equipped with a biometric fingerprint lock, so you can access your gun quickly with one finger – click here to check out best biometric gun safes. It takes less time to enter a biometric under the bed safe that it does with a larger safe since you do not have to spend precious time entering a combination or fumbling with keys.You should definitely look into one if you have young children in your home. 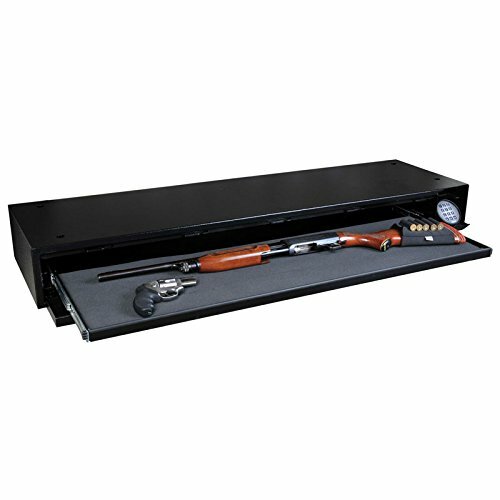 CAPACITY : Tray inside is 43 1/4" by 12 3/4"
This under the bed gun safe is large enough to fit a shotgun and one or two pistols. The safe is made out of 14 Gauge steel, and the door has a five-point locking system. The safe is specially designed to fit under your bed, and it has a height of only 6”. This model comes with all the mounting hardware you’ll need, and it also has 4 pre-drilled holes that will help with the installation. This heavy duty under the bed safe weighs 74 lbs. This is a sturdy safe, and you can anchor it in place with ease. The safe’s weight and the anchors will make it almost unbreakable. The safe is specially designed to fit under your bed, so the manufacturers included a small light that will allow you to punch in your security code. This is a great feature, as it will facilitate your access to the safe at night. The gun safe doesn’t come with a key backup. This can eventually lead to a problem if the combination locking system fails to open the safe. The foam tray is not spring loaded, so you will have to drag it out of the safe. This might be uncomfortable to do when the safe is under the bed. The Hornady Rapid Safe is specially designed to protect your firearms against thieves and to keep them away from children. The safe’s safety standards exceed the international ones, and they offer increased protection against drop, pick, pry, and saw attacks. The safe’s exterior housing is constructed out of 14-gauge steel, and the door locks using two hardened lugs. The safe comes with a security cable that will allow you to secure the safe in multiple locations. This gun safe meets the TSA requirements for safety. This means you’ll be able to use the safe to load your rifle on a plane without any problems. The safe’s racks are adjustable, and you can use them to store one or two rifles properly. The safe can be powered by batteries, but you can also plug it into a wall outlet. The safe’s locking mechanism is pretty tricky to use. Some people might encounter problems when trying to close the safe’s door. The safe’s power cord is not very long, so you will need to either place it near an outlet or use an extension cord. This safe is a great size with a large slide out drawer. The inside is spacious so you can store a handgun an extra clip. 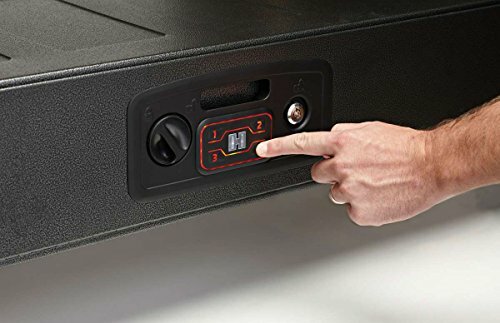 The safe is also good for your vehicle since it is small and easy to carry.See how it compares to specialized car gun safes in our review list of the best car gun safes. It is equipped with a digital combination lock. You can program the safe with a three to eight number access code. The safe comes with a seven-year consumer warranty. The safe is heavy enough that if an intruder finds it they probably won’t attempt to carry it away. Comes with an override key in the event that the battery goes dead, or you forget the access code. The safe is small so it easily fits under the bed or in tight spaces. The safe is large enough to hold small rifles. You have to use a tool to remove a plate so you can use the override key. The safe is too heavy for you to carry it with you every time you leave home. The price is a little high since you can get an upright safe for around the same price. It is not fireproof or waterproof. Many people want a small safe to store items other than guns so they don’t want to spend hundreds of dollars on a steel safe. This is a suitable cheap alternative if that’s your line of thinking. This rolling storage container is great for your home or a dorm. It fits perfectly under the bed since it has a low profile. It also comes with a steel security cable. This is an excellent storage container to lock your valuables in whether you are an adult or teenager. The wheels allow you to move the safe quickly without doing any heavy lifting. 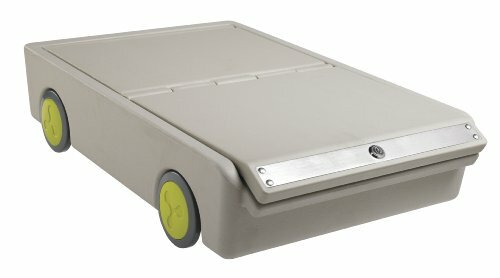 It is equipped with wheels so you can roll the storage container under the bed, unlike many others that you have to lift. Comes with two keys. If you buy this for your teenager, you can give them a key, and you can keep one in the event they lose theirs. This would be a good safe to lock things away from toddlers or small children. You can carry this safe with you when you travel. This safe is made of plastic, so it is not waterproof or fireproof. A thief could easily gain access to the safe. I would recommend you buy a padlock to lock the safe since the keys are universal. This does not require a battery like many other small safes. It is small enough to fit under the bed or carry along with you when you leave home. 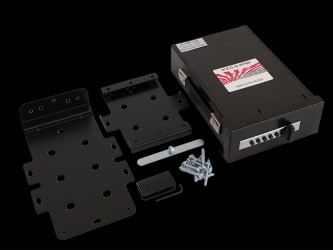 You can mount the safe to a solid surface with the mounting brackets that are included. If you decide to move the safe, it only takes a matter of minutes to move it from one permanent location to another. The safe comes with a one-year manufacturer warranty. 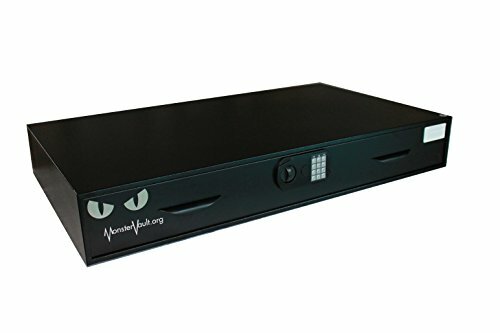 Does not require a battery, so you do not have to worry about losing access to the safe. The gun swings out when the door opens making it quicker to retrieve your handgun than many other safes. You have the option of adjusting it to hold different size firearms. The push button combination lock makes it quicker to access than safes with key locks or combination dials. You can mount this safe under your bed out of sight of children and thieves. The safe is a little expensive compared to similar ones from other companies. You cannot store extra ammunition inside unless you pay more money for the ammo box. An experienced thief could gain access to the safe with the help of some hand tools and a little time. This safe is equipped with an electronic lock that is illuminated making it easier to access the safe in the dark. The slide-out gun tray is padded to prevent your gun from being damaged. You also have the option of anchoring the safe to the floor with the pre-drilled holes and the mounting kit that is included. The American Security website has manuals you can download for the warranty information of all their products. Illuminated keypad so you can easily and quickly access your safe in the dark. It beeps when you press a key, but this can be turned off if you prefer having the safe in silent mode. The safe will beep when the batteries are going dead, so you do not lose quick access to your safe. The drawer is big enough to fit two long guns. The steel is thick but not thick enough to cause problems with you getting it under your bed or in tight spots. The keypad is a cheap plastic that is just screwed into the safe making it easy to bust. The steel is only fourteen gauge and would be easy for an experienced burglar with a pry bar to gain access. The lag bolts that come with the same aren’t as heavy duty like the more expensive models. 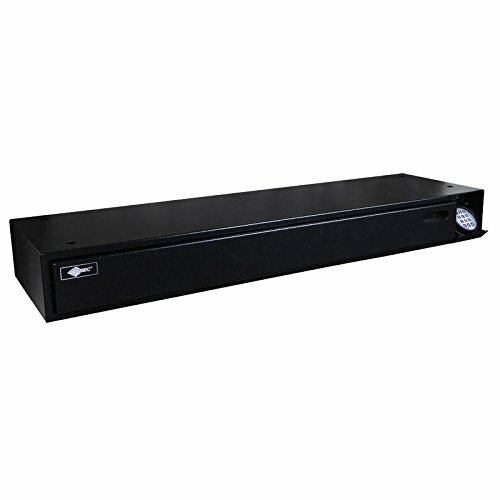 One of the main reason for purchasing an under bed gun safe is accessibility. In case of intruders in your home, that is one of the best places to hide a gun. Having it placed strategically under your bed will make it much easier for you to grab it and protect yourself and your family even in the dark. 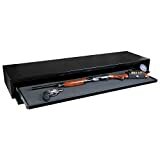 There are many brands and models out there in the market that sells under bed gun safe. So how will you know which one is best for you? Here I have listed some guides or tips on how to pick which one is for you. What material will you want it to have? Will you pick a metallic kind or a plastic kind? Do you want it to have rollers? How heavy the safe is. Can you access it fast in case of emergency and it is dark? Do you want a fireproof or waterproof kind of safe? If you are looking for safes that have these qualities, you need to have a bigger budget because these kinds of safe are expensive. Check out what fireproof gun safe is about here. Do you want a mechanical kind or a biometric kind that scans your fingerprint for easy access? Do you want a safe that is battery operated or chargeable? Lock and key or just combination access codes? Read some customer reviews and testimonials before buying the gun safe. Reading testimonials helps a lot when choosing items because some criticized or praised honestly. that if you have kids to pick a heavy kind of safe and something that is hard to open. Kids are always curious and might find a way for them to open your safe. They are also intelligent and can remember your access codes even when they have only seen you open it once. So keep it safe. Having a gun will protect your family but will also harm them if not kept properly. And lastly always remember that you are responsible for your gun, so keep it safe. Every day someone is searching for a gun. Every day someone is also murdered by a gun that got into the wrong hands. Every day an intruder enters a home. You could be home, and an intruder could enter your home with a gun that has fallen into the wrong hands. A small gun safe is good for keeping yourself ready at any moment to protect your family while keeping the guns away from children as well. If you have kids around your house, you know as well as I do that children are curious. Buying a small gun safe will not necessarily keep your gun out of your children hands but it will keep it out of sight. A child can open many small gun safes. Most of them can be opened by picking them up a few inches off the floor and dropping them onto a hard surface. See it yourself! If you purchase an under the bed safe, I recommend you buy one that has pre-drilled holes so you can bolt the safe to the floor. Bolting the safe to the floor will keep your kids from lifting the safe off the floor and dropping it if they do happen to find it hidden under the bed. Many under the bed safes are made for to have quick access to your weapon and some of them have illuminated keypads. There is also a small number of under the safes that are large enough to house a couple rifles. A small under the bed safe will not keep a thief away from your guns if they have a little time and a hand tool. Most of them also won’t protect your weapons from fire or water damage. An under the bed gun safe is useful for keeping your weapon away from small kids while being able to get to your gun quickly. 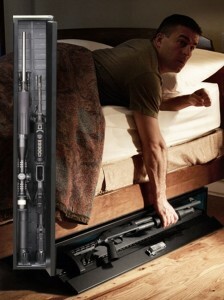 I think all gun owners should own an under the bed gun safe. If they have young children, I think it should be placed in the law. They should all be bolted to a surface so kids cannot pick up the safe and drop it causing it open. 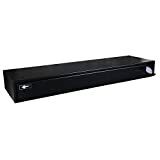 Above are a few reviews for some of the top rated under the bed gun safes. There is a small number of under bed gun safes that are waterproof and fireproof, as can be seen in our list of the fireproof gun safes reviews. They are meant to keep your gun out of a child’s hands while being able to access the gun in a quick matter if the need arises to protect your family from an intruder. Under bed gun safes range in price, size and have a variety of features that you will like in a small safe. I recommend that all the little gun safes be bolted to the floor. What is the difference between the Stealth Defense Vault and the American Security Defense Vault? They look exactly the same although the Stealth Defense Vault seems to get better reviews.